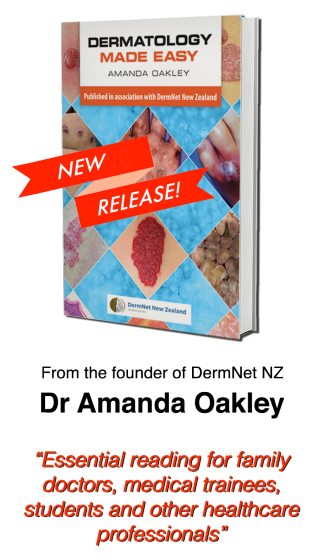 Published in 2017, "Dermatology Made Easy" is a DermNet New Zealand book about common skin conditions by Associate Professor Amanda Oakley, DermNet New Zealand founder. The book is based on the most popular topics from DermNet NZ's vast array of material. It combines the essential focus of the ‘Made Easy’ book series with the authority and knowledge base of DermNet NZ's unparalleled resources. The result is a book that helps the reader diagnose, test and treat conditions quickly and accurately. It is a concise overview of the common dermatological conditions most likely to present in general medicine. The book also is available from usual booksellers. A free taster chapter is available here.